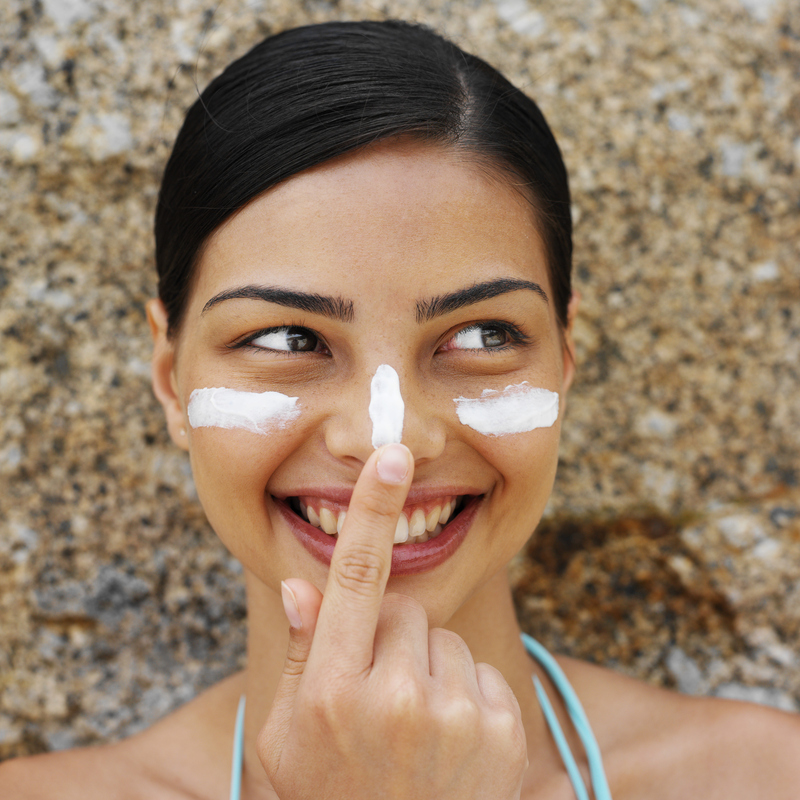 Common ways you're screwing up sunscreen, and how to truly protect yourself from the sun. Just like the rest of your skin, lips are vulnerable to UV rays, so it's extremely important to use sunscreen on your mouth, Dr. Graf says. But don't use the same stuff you use on the rest of your body—it tastes weird and won't last that long on your lips anyway. So try a lip balm with SPF, which is thicker so it stays on longer. "Then reapply even more frequently than you do body sunscreen, since talking, eating, and drinking removes the sunscreen on your lips faster," she says. The small print on your sunscreen label matters, so make sure you're choosing the right sunscreen for your activity, especially if that activity involves sweat, a pool, or the ocean. "Make sure you get a water-resistant formulation for swimming or activities where you'll perspire, because non-water-resistant formulas can slide right off," says Dr. Sherber. "Plus, they tend to mention migrate into eyes and sting, whereas water-resistant ones won't." It's not just a marketing gimmick: There is a difference between face- and body-specific sunscreens. "Facial skin is generally more sensitive to irritation than body skin, so face formulations have been tested to cause less irritation and not trigger acne," says Dr. Sherber. "If you're acne-prone or sensitive, avoid the body versions for your face, especially the dry-touch sprays—they're absolutely full of alcohol, which is very drying and irritating for facial skin." The old rule about using a shot glass worth of sunscreen every time you apply still holds up, says Dr. Graf. (That's about 1.5 ounces.) But now that more of us are opting for continuous spray formulas, it can be hard to tell if we're really getting enough coverage. To make sure you're using sprays correctly, she suggests holding the can six inches from skin and spraying nonstop, so you can see the moisture covering the entire area. "Then rub it in—yes, even if the bottle says you don't have to—so you don't miss spots," Dr. Graf says. "And repeat the spray a second time." It used to be that many sunscreens only blocked UVB rays, the high-energy kind responsible for sunburns. But shielding against UVA rays is just as important, says Dr. Graf, because they "penetrate the skin more deeply, are constant throughout the year, and cause premature aging." Umm, no thanks! To be fully covered, look for sunscreens labeled "broad spectrum," which means they thwart both types of rays. And good news: these formulas are increasingly becoming the norm. Yes, tanning oil with SPF 8 technically is sunscreen, but it's just not enough protection. The Skin Cancer Foundation recommends using broad-spectrum sunscreen with at least SPF 15. But should you go higher? Some say the often-pricier high-SPF sunscreens are a waste of money, since they don't provide much more protection—SPF 30 blocks 97% of rays, while SPF 50 blocks just 1% more. However, they do have some benefit. "They absorb more free radical-producing energy, so I recommend them for the summer," Dr. Graf says. One caveat before you reach for the SPF 100: "The super-high SPFs can provide a false sense of security, like you're protected for longer, but you need to reapply just as often as you would an SPF 30." If you're using enough sunscreen when applying—remember that shot glass-worth, or those two coats of spray?—then having bottles leftover from years past shouldn't be much of an issue. But if you happen to have sunscreen that's been lingering for two years or more, Dr. Graf says to chuck it, since it can lose its effectiveness over time. Seeking solace under a beach umbrella or an awning near the pool doesn't mean you're getting adequate protection from the sun. Why? Sand and water both reflect damaging rays, and 34% of UV radiation gets through when you're under a beach umbrella, "so you still have to apply sunscreen if you're sitting under cover," says Dr. Graf. Even if you don't get a sunburn, you're still getting UV exposure.